Academy Award-winner Brie Larson stars in Basmati Blues. The trailer of Oscar-winner Brie Larson's latest offering, 'Basmati Blues', is viral for all the wrong reasons. The cliche-rich trailer, complete with a Bollywood dance sequence, shows Larson's character travelling to India to sell genetically-modified rice to farmers. The two and a half minute clip, which shows all things stereotypically 'Indian' like stray goats and spicy food, has been thrashed online for 'white-washing' and cultural appropriation. 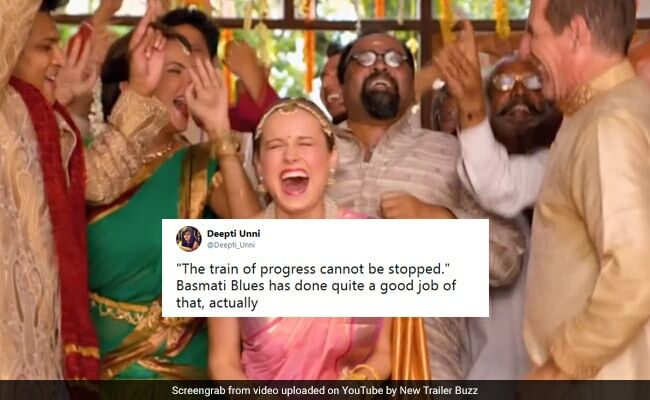 'Cringe-worthy' has been used often in tweets to describe the 'Basmati Blues' trailer. While many expressed their disappointment with Larson for signing up for the role of the "white savior to Indian people," others slammed the trailer for generalizing a culture down to outdated cliches like a horse-riding heroine who dances to Bollywood music. I love Brie Larson but I hope "Basmati Blues", a movie where she goes to India and saves locals from tainted rice, flops. Let us know what you think of the trailer using the comments section below.